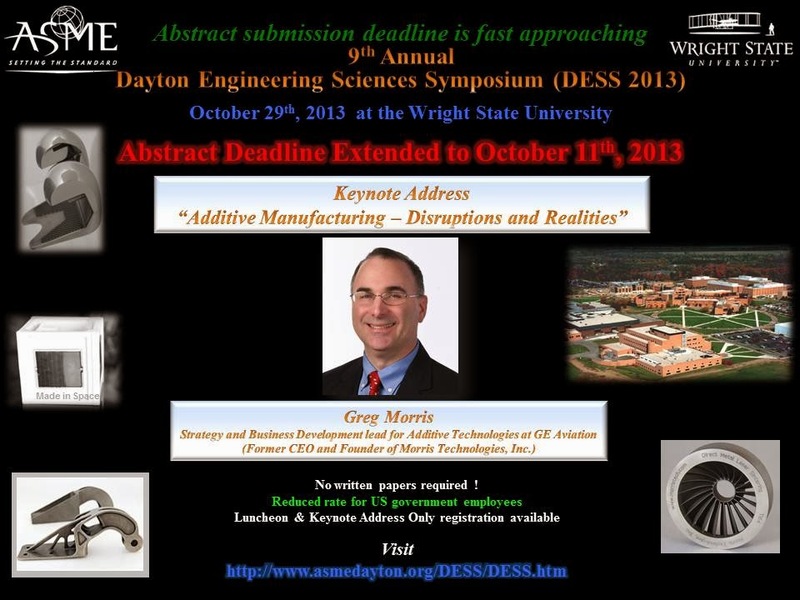 The 9th Annual Dayton Engineering Sciences Symposium (DESS 2013) is coming up on 29 Oct 2013. The theme this year is 3-D printing, and the keynote speaker is Greg Morris of GE (Morris Technologies). Sponsored by the American Society of Mechanical Engineers (ASME) Dayton Section, the symposium is designed to facilitate communication between members of the regional technical community, as well as to provide a forum for students (both undergraduate & graduate), engineers, and researchers to present their work. The symposium program will include several parallel sessions in the morning and afternoon, addressing Applied Engineering; Biomechanics; Controls Science; Design & Optimization; Electronics & Sensors; Engineering Education; Fluid Mechanics; Industrial & Human Factors; Materials & Processing; Nanotechnology; Power, Propulsion, & Energy Systems; Structures & Solid Mechanics; Thermal Sciences; Engineering Innovation; and Undergraduate Design Projects. The symposium will also include a luncheon, keynote address, and poster session. Looks like lots of neat 3-D printing research going on right here in Dayton!